There’s a new text-to-speech app now in the iTunes App Store that we’re pretty sure students, parents and educators are going to love. It’s called Claro ScanPen and was developed by Claro Software, a highly-respected company with a strong history of developing assistive software for students with learning disabilities such as dyslexia, visual processing issues, working memory deficiencies and other language-based delays and disabilities. Claro’s flagship product, ClaroRead, is easily one of the most highly recommended reading and writing support tools for PC and Mac users all around the world. ScanPen is a bit of a departure from the company’s wheelhouse of computer-based solutions, but has been specifically designed to capitalize on the power, camera resolution, and portability of iOS devices. ScanPen, is an app that can be used in combination with the camera on your iPhone, iPod or iPad to scan a photo of printed text and read it back to you aloud using OCR (optical character recognition) and text-to-speech. The app is available in the iTunes App Store starting this week for only $6.99 (£4.99) and despite the impression you might get from that meager price point, offers pretty impressive OCR thanks to its top-quality ABBYY OCR engine and requires NO internet connection! We will start by stating right up front that this is not the most high-octane, feature-filled app. It’s really designed to do just one thing – and do it REALLY well. You’ll see what we mean as you keep reading. In a nutshell, ScanPen lets you snap a photo of a page of printed text and then reads it back to you using your chosen voice and swipe settings. When you first open the app, the camera is active and ready for taking a picture and there are just 3 buttons on the screen for clicking – super simple, right? The gear icon at the top right will take you to some of the settings and options (we’ll get to those later), the circle centered at the bottom takes the photo (as you’d expect), and the icon at the very bottom right will let you choose an existing photo from an album or gallery on your device. Once you’ve taken or selected your picture, you just swipe your finger across the text to hear it read aloud right there on the spot. 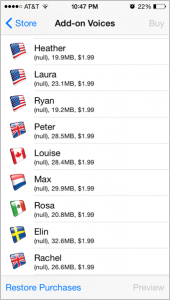 The default voice is the standard iOS voice for your country (USA, UK, etc.) and the default swipe/read setting (labeled ‘selection modes’ in the settings) is to read by line. Reading by line means that when you swipe across a part of any line of text, ScanPen will read back any of the lines you’ve touched starting from the very left side of the page and continuing to the end of that line. Keep in mind though, ScanPen doesn’t care if that line contains whole sentences or not. It will read complete lines of text from left to right regardless of whether those points are the beginnings or ends of sentences. The other selection modes are ‘All’ and ‘Words’. Choosing the ‘All‘ setting will tell ScanPen to read the entire page from beginning to end in response to any swipe anywhere on the screen of text. Choosing ‘Words‘ will tell ScanPen to read just those words that are specifically touched by your swipe. 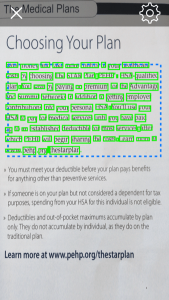 Again, a word of caution, when you swipe by word, ScanPen does not care if your swipe covers a full sentence or crosses down into multiple lines. The Words selection mode does exactly as it is supposed to do, no more and no less. 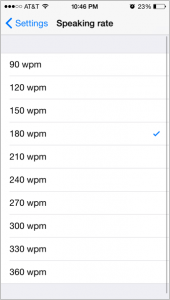 So, when should you choose to select text by word, by line or by page? It really depends on the user and their needs. Reading a full page could be useful for students listening to a study guide on the bus right before a test, or for reading whole chapters of a textbook one page at a time (although something a bit more feature-rich such as PC or Mac-based ClaroRead would likely be a better choice for long texts like that). Reading by word offers a terrific benefit for older students and struggling readers. This lets them read as much as they can independently, and use ScanPen for assistance only when they need it. This actually does two things for the student: First, it encourages the student to use ScanPen as a stepping stone as opposed to a crutch; and second, it helps to build confidence in struggling readers by letting them do a bit of problem solving on their own instead of feeling like they’re always running to mom and dad, or teachers for help. 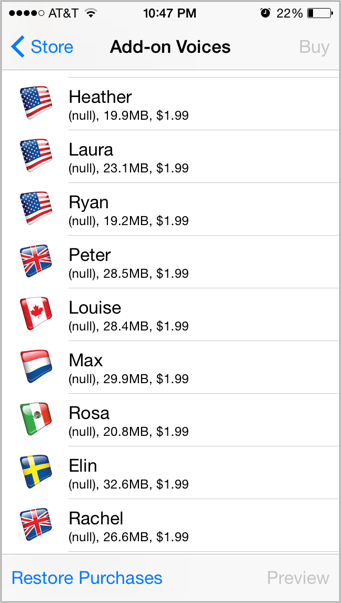 The default voice in ScanPen is going to be the standard iOS voice for your country (USA, UK, etc.) 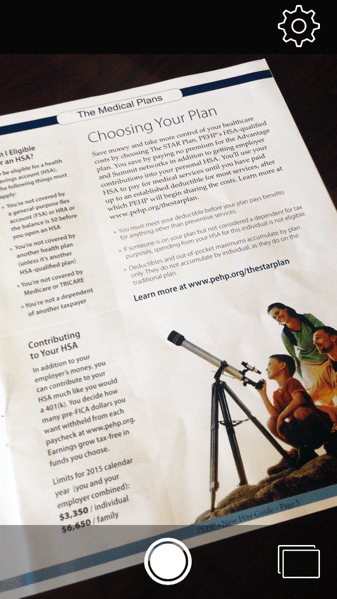 but there are some other options to choose from (some are free and some are not). If your student is an avid iPad, iPod or iPhone user they may find that they prefer the default English voice to some of the others simply due to the familiarity of it, but definitely test the others out to see what works best. Should you choose to try some voices not standard to your device, they are available as an in-app purchase for $1.99 (£1.49) each. Students not already using text-to-speech software or devices may find the more unfamiliar voices to be a bit of a distraction at first. It’s kind of like when you buy a new phone and get so caught up in all the new features you forget its primary purpose is to make phone calls. Alternatively, if your student is already using Heather or Ryan with any of their other assistive tools you’ll definitely want to ante up for those voices in ScanPen too. Now that you’ve captured a page, set the selection mode and chosen a voice, there’s really only one thing left to do (we told you it was super simple). Next, you’ll want to test out and set speaking rate (speed). To set the speaking rate, just tap the gear icon like before and then touch ‘Speaking rate’. 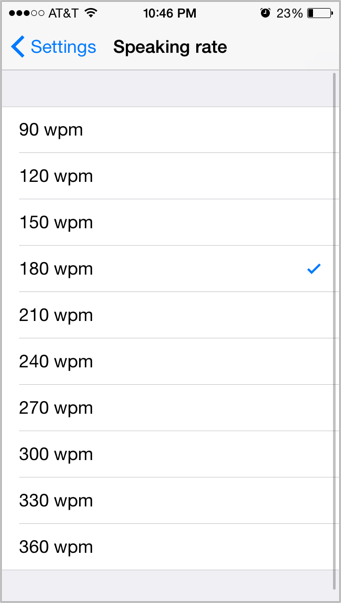 There are 10 settings to choose from ranging from 90 wpm (words-per-minute) to 360 wpm. The rate selection again will depend on your student’s age, reading level and the task at hand (homework, study review, single word help, etc.). If ScanPen is their first foray into the word of assistive technology, you’ll want to start them off on a slower rate and let the student work up to a faster rate as they get more used to using tools like this. Students more accustomed to text-to-speech technology will be able to start at a much faster speaking rate and probably even increase from there over time. In fact, people who use text-to-speech products really regularly will quite often listen at a rate that sounds almost indecipherable to those of us with less experience. This allows students using AT products to get through text at a speed similar to that which their non-disabled peers read naturally. Having a lightweight OCR and text-to-speech tool like ScanPen tucked away into their iOS device means that students who might have shied away from higher education or loftier career goals in the past due to their disability now have the confidence to reach higher than ever before. Students with dyslexia and other learning disabilities can study between classes; go out to lunch with friends; and even head confidently into new employment settings knowing ScanPen is there to (inconspicuously) back them up if they need it. Another benefit of having an OCR app like this is that it allows students to zero in on specific skills like reading comprehension – without being slowed down or tripped up by their reading deficiencies. That means students who are below level in reading, can still participate on level in math when it comes time for word problems! In addition to being a great go-anywhere tool for people with reading difficulties, ScanPen can also be used by those with little to no vision at all. 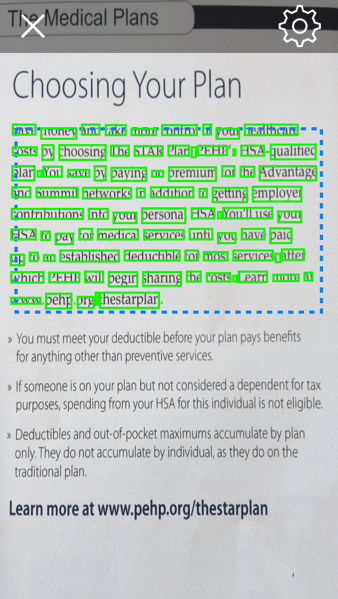 For example, a user who is blind could use VoiceOver, which is already built-into iOS devices, to snap a photo of a piece of text and then navigate the menus to set the highlight to “all” to trigger ScanPen to begin reading the scanned text. ScanPen would be equally as awesome for reading questions aloud during tests or homework time (with the internet turned off and iDevice ‘locked down’ of course), or scanning an above-level article in a newspaper (do they still make those?) for a current events assignment. It could also be used for reading instructions on food packages or reviewing dorm rules and syllabi at the start of the semester. OCR and text-to-speech tools like ScanPen are quickly becoming nearly indispensable to students with dyslexia and other reading disabilities – especially at the higher grade-levels. Teachers in special education are sure to find a great value in this app as a diagnostic and everyday support tool for their students, and ScanPen packs quite a punch considering its price. Whoever said you get what you pay for had obviously never tried this app! You can download Claro ScanPen on the App Store now!